A divorce proceeding is a civil action, similar to a lawsuit, in which you ask a court to grant you a divorce decree. You may obtain a divorce in the United States even if you married overseas. Your marriage must have been valid under the laws of the jurisdiction where you married, and you must serve legal notice of the divorce proceedings to your spouse's current address, even if it is overseas. The proceedings will be governed by the laws of the state where you file the action. Find your spouse's current address. Research your state's "long-arm" statute, if the divorce is not consensual, to find out if it empowers local courts with personal jurisdiction over a spouse who lives out of state or overseas. If the long-arm statute does not authorize personal jurisdiction over your spouse, you cannot obtain a divorce in a state court unless your spouse agrees to divorce. Complete a divorce petition. You must supply the date and place of your marriage, your address and your spouse's address. If the divorce is not consensual, you may have to allege grounds for divorce, depending on state law. Include any desired property settlement and child custody arrangements. Fill out the summons in duplicate. The purpose of the summons is to notify your spouse of the divorce proceedings and the date and place of the divorce hearing. If the divorce is consensual, prepare an affidavit of waiver of service of process instead, with a space at the bottom for your spouse to sign. Prepare an English language translation of your marriage certificate, if it is printed in a foreign language. Use a licensed translator who will include an affidavit guaranteeing that the translation is accurate. Prepare a translation of the divorce petition and the summons or the waiver affidavit into the language of the jurisdiction where the marriage took place, if this is required by the law of that jurisdiction. Use a licensed translator. Deliver both language versions of the divorce petition, a copy of your marriage certificate, and the summons or the waiver affidavit to the county court in the jurisdiction of your residence. The court will forward a copy of these documents to your spouse's overseas address by international registered mail, return receipt requested. 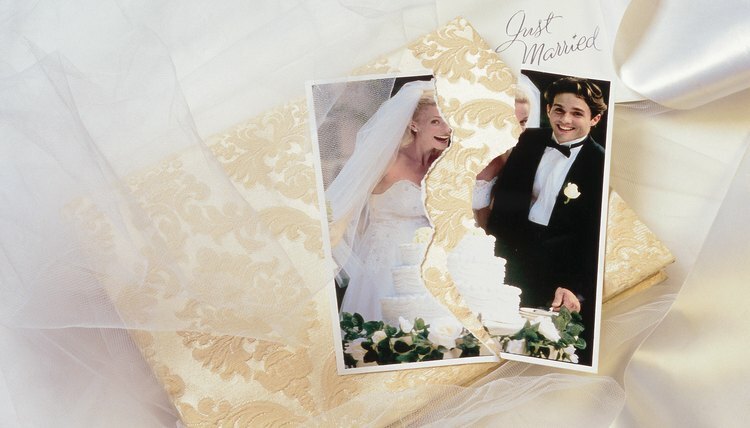 An annulment is different from a divorce -- a divorce legally ends a valid marriage, whereas an annulment declares the original marriage invalid. The grounds for annulment are strictly limited, and annulments are granted far less frequently than divorces. Virginia, like other states, applies its own annulment law, including a statute of limitations. If you find that you are ineligible for an annulment, you can still obtain a divorce in Virginia, as long as you meet residency requirements.